This site was the first of several sites by NRDC to be installed in a multisite configuration, as they migrate new and existing sites to Drupal. Original sponsors of the Embedded Media Field module, it was also the first site to launch with that module, as seen on its Video page. Taking on corporate polluters and government indifference in court; We sued the U.S. Navy and stopped them from blasting the world’s marine mammals with deadly hi-frequency sonar. Helping companies and institutions see the ‘green’ light; We’ve partnered with Warner Music Group to revolutionize their music label into the greenest on earth. Making smart sustainable policies the law of the land; We ensured that a half million kids in California are getting tested for lead poisoning every year. No matter what the method, we do whatever it takes to protect the planet - for all of us. Join NRDC - for as little as $10 - and sue the crap out of b-holes, too. The site combines a “Blog-a-Zine” combined with an aggregation of its parent organization’s Switchboard. 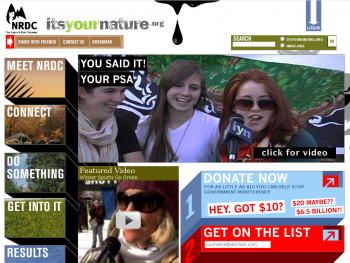 It offers several features to help activists, such as downloadable PDF’s of environmentally friendly tips, current petitions, and current initiatives of the NRDC. It also has a listing of past victories of the NRDC. A heavy media site, users are also able to browse its Video Library and other media downloads, such as music, podcasts, and screensavers. As noted, this site features the Embedded Media Field, which means that editors are able to simply able to paste the URL of a third party video, such as from YouTube or MySpace, and the module will automatically parse and appropriately display the desired video, featuring it on the front page and its Video archives. It also uses a custom-built aggregrator to feed in content from its parent site. The site also features a back-end for its rotating flash banner, so that editors may administrate that, adding images and text copy, and determining its animation features. The site was built last spring in Drupal 5, and makes heavy use of Views. The site is heavily themed, with different themes for each section of the site. To this end, various page-PAGEVIEW.tpl.php files were created to easily handle the theme switching. As the NRDC continues moving sites to Drupal, they plan to merge the user databases together, to give users a sense of unified functionality across their many sites. Since this is now part of an existing multi-site installation, as we Drupalers know, this will be a piece of cake.